With so many distractions it is hard to let your kids get behind the wheel. Driving is risky business. One of the most important lessons for new drivers is what it means to be a defensive driver. Kids think “I’m a good driver” not thinking about what the other drivers around you are doing. As a defensive driver, you can avoid crashes and help lower your risk behind the wheel. If you've been out on the roads, you know that not everyone drives well. Some people speed aggressively. Others wander into another lane because they aren't paying attention. 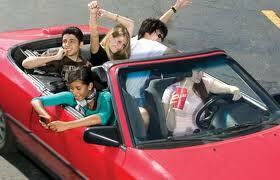 Drivers may follow too closely, make sudden turns without signaling, or weave in and out of traffic. Aggressive drivers are known road hazards, causing one third of all traffic crashes. But inattentive driving is becoming more of a problem as people "multitask" by talking on the phone, texting or checking messages, eating, or even watching TV as they drive. Stay focused. Driving is primarily a thinking task, and you have a lot of things to think about when you're behind the wheel: road conditions, your speed and position, observing traffic laws, signs and signals, following directions, being aware of the cars around you, checking your mirrors — the list goes on. Staying focused on driving — and only driving — is key.